We’d love your help. Let us know what’s wrong with this preview of The Last Four Things by Paul Hoffman. The epic story of Thomas Cale-introduced so memorably in "The Left Hand of God"--continues as the Redeemers use his prodigious gifts to further their sacred goal: the extinction of humankind and the end of the world. To the warrior-monks known as the Redeemers, who rule over massive armies of child slaves, "the last four things" represent the culmination of a faithful lif The epic story of Thomas Cale-introduced so memorably in "The Left Hand of God"--continues as the Redeemers use his prodigious gifts to further their sacred goal: the extinction of humankind and the end of the world. To the warrior-monks known as the Redeemers, who rule over massive armies of child slaves, "the last four things" represent the culmination of a faithful life. Death. Judgement. Heaven. Hell. The last four things represent eternal bliss-or endless destruction, permanent chaos, and infinite pain. Perhaps nowhere are the competing ideas of heaven and hell exhibited more clearly than in the dark and tormented soul of Thomas Cale. Betrayed by his beloved but still marked by a child's innocence, possessed of a remarkable aptitude for violence but capable of extreme tenderness, Cale will lead the Redeemers into a battle for nothing less than the fate of the human race. And though his broken heart foretells the bloody trail he will leave in pursuit of a personal peace he can never achieve, a glimmer of hope remains. The question even Cale can't answer: When it comes time to decide the fate of the world, to ensure the extermination of humankind or spare it, what will he choose? To express God's will on the edge of his sword, or to forgive his fellow man-and himself? To ask other readers questions about The Last Four Things, please sign up. Wow, I'm so disappointed. I think I just wasted my time. How did this get so bad and so out of control? I had liked the first book, really liked it and I got into this hoping and wishing for a book that would blew me away... Instead, I got a bland, boring book.. I swear, by the end of the book nothing has really happened. I did an experiment while reading the book and read some paragraphs and skipping some because I felt like there were lots of detail with no reason whatsoever. The writing, the p Wow, I'm so disappointed. I think I just wasted my time. How did this get so bad and so out of control? I had liked the first book, really liked it and I got into this hoping and wishing for a book that would blew me away... Instead, I got a bland, boring book.. The writing, the plot.. Everything is all over the place. The author overdoes it a bit, I think he's too dramatic for his own good and sometimes what he describes is incoherent. The plot instead of thickening, it goes thinner and thinner and by the end of the book it had dried out. The characters.. I don't like the lot of them, not after reading this. The characters felt shallow and empty with no feelings whatsoever and while I forgave them in the first book for being this way, I did because they were all their lives grown to a certain way of life, but even after so long out there, they still remain cold and soulless. This had a very different feel to the first book in the series. I was more of a droll military fantasy. I liked it, but not as much as the first book. The plot lacked the humor and fast pace of the first book, but was still interesting enough. I enjoyed learning more of Bosco's plans for Cale and the world as a whole and his scheming made for compelling reading. He does think big! Cale is still an interesting character to read about, but he is a bit less likable in this one as he was still strug This had a very different feel to the first book in the series. I was more of a droll military fantasy. I liked it, but not as much as the first book. Cale is still an interesting character to read about, but he is a bit less likable in this one as he was still struggling to come to terms with Arbell's betrayal. Both Vague Henry and IdrisPukke had smaller roles and that is largely the reason why this lacked the humor of the first book. Kleist has a subplot of his own and it was good to learn more about him as a character. He is not the most likable guy ever, but I felt like he grew over the course of this book. All three of the younger characters are a great mix of cynical and naive. It makes them easy to like despite some of their actions. The ending was quite a shock and it will be interesting to see how things develop in the third book. as The Left Hand of God, with the same alternating of styles, tones and narrative modes; there is considerably more backstory and world building and things make sense and hang together well, but the same "all but the kitchen sink" is thrown in and this one has some stuff that's even more outrageously funny than in The Left Hand of God and I found myself shaking with laughter often, though the book is also pretty dark and not for the easily offended. Edit 4/18: About 100 pages to go out of 400+ and The Last Four Things has been all I expected and more; I would have easily finished the book in the weekend but I enjoy it so much that I do not want it to end so every 100-150 pages I reread them before going forward. Cale, Bosco, Vague Henry, Kleist and a few more new characters are shining - of course Cale first and foremost - but the rest have also great lines on occasion. Edit 4/18 later I finished the book and while what I expected to happen, happened, the book went further, twisted again and left me a bit stunned without again having much of a clue about what's going to happen in the 3rd volume; this time the author has a great two page explanation about his sources, including famous philosophers,Catholic thinkers, poets, obscure manuals of war that are available online and one (in)famous speech of Saddam Hussein (seems to be on YouTube) that *** cribs here before ***. If anything, it was only marginally better than the first book. In other words, still completely horrible to read. The Last Four Things was a confusing mess of random turn of events, spurred on by the whims of characters who themselves don't know what they want to do. If the plot wasn't being predictable as hell, it was being entirely random; kind of like a retard wandering around a well-known paved road and then deciding in his little mad head to go off the path into the unknown. 1. The battles If anything, it was only marginally better than the first book. In other words, still completely horrible to read. The Last Four Things was a confusing mess of random turn of events, spurred on by the whims of characters who themselves don't know what they want to do. If the plot wasn't being predictable as hell, it was being entirely random; kind of like a retard wandering around a well-known paved road and then deciding in his little mad head to go off the path into the unknown. 1. The battles were short, underwhelming and overly pathetic. 2. The interactions between characters were shallow and dull. 3. The motivations and actions of some of the primary characters are as fluid as water and just as random. 4. The random mixing of names and places from the Real World (ours) into this imaginary universe serves only to heighten the sense of confusion one gets when reading this novel. 5. The immaturity of the main character, Thomas Cale, was pretty much the death knell that sunk the book. How can such a blood-thirsty person and a genius at military warfare in his late teens, still act like the 12 year old acolyte he was in the first book? Surely all the blood and gore flowing as a result of his actions/planning would have made him far wiser and mature. But no, it seems like he regressed into the child-like and immature little brat that author wants him to be. I was underwhelmed by The Left Hand of God, while I thought it had potential it was also flawed. The test was going to be whether the author built on the potential or not. Sadly, in The Last Four Things the flaws are much more evident in a rather difficult read where the author seems to have abandoned the potential and built in more flaws! The narrative style seems different, with a smug observational style and the author then rather over indulges himself in the very things that jarred in the fi I was underwhelmed by The Left Hand of God, while I thought it had potential it was also flawed. The test was going to be whether the author built on the potential or not. Sadly, in The Last Four Things the flaws are much more evident in a rather difficult read where the author seems to have abandoned the potential and built in more flaws! The narrative style seems different, with a smug observational style and the author then rather over indulges himself in the very things that jarred in the first novel! Lead character Cale continues to be hard to emphasise with and indeed it is hard to relate to anyone in this novel. Add to that a somewhat meaningless plot set in a world that has many familiar names and places and yet is not `our' world, yet the author offers no explanation. This was very painful to read, a real chore and an utter waste of a few reading hours. Avoid like the plague, if ever there was a book where the editor or publisher needed to step in and re-direct the author, this is it. Ora portanto, resumindo o livro numa "palavra": nhe. Quando li A Mão Esquerda de Deus, ao início achei o livro um pouco parado e desinteressante. No entanto a partir mais ou menos das 100 pág a história começou a tornar-se interessante. Parecia que as coisas aconteciam com uma finalidade. Quando parti para As Quatro Últimas Coisas ia preparada para que pudesse, eventualmente, acontecer o mesmo. Um início mais morno e depois desenvolvimentos interessantes. Não podia ter ficado mais decepcionada. O Ora portanto, resumindo o livro numa "palavra": nhe. Quando parti para As Quatro Últimas Coisas ia preparada para que pudesse, eventualmente, acontecer o mesmo. Um início mais morno e depois desenvolvimentos interessantes. Não podia ter ficado mais decepcionada. O livro começa e termina com críticas mais que directas à igreja. Não tenho problema nenhum com isso, deixo já este esclarecimento. Mas quando comprei este livro não foi de certeza com o intuito de ler um texto reflexivo contra a igreja, foi sim com a ideia de ler uma história interessante. Isso não aconteceu. A verdade é que basicamente não existe história. O livro não passa de um enorme enrolanço. Antes do meio do livro sentia-me confusa e já não percebia para quê tantas voltas e afinal qual a finalidade de tudo aquilo porque os personagens estavam a passar, que diga-se de passagem, não eram nada de especial pois tudo se resolvia com estrema rapidez. As personagens parecem ter perdido profundidade ao longo da história em vez de a ganharem, principalmente Cale. Sinceramente deixou de me dizer o que quer que seja. A única personagem que talvez me continue a agradar é o Henri Vago. When reading the first book I fell in love with the main character. And the idea for the story? Wow. Very nice there Hoffman! But when I finished the first one I was left with the thought that not a lot had actually happened in it. Sure, there were parts of action and big revelations, but when I turned the last page I was still waiting for that something. Never the less was I totally excited for the second installment. I though the style of the first one must surely have been just because of that: lacking because we were just getting to know the characters. Everything would probably come together better and dig deeper into Cale as a character in the second one. But is just... didn't. I am starting to wonder, and worry, if this is really the way the author writes his books. Thomas Cale. Čtyři poslední věci je již druhý díl této trilogie. Pro hlavního hrdinu mám opravdu velkou slabost. Již v prvním díle si mě získal svou krutostí, chytrostí, nebojácností, ale také dobrým srdcem. Po přečtení druhého dílu jsem si říkala, že by Thomasovi neuškodila ještě krutější povaha. Obvykle to nesnesu, ale tenhle akolyta si o to naprosto říká. Nicméně, ačkoli jsem byla z pokračování Levé ruky Boží unešena, nemohu říci, že by bylo stejně tak výborné. Ani nedokážu přesně popsat v če Thomas Cale. Čtyři poslední věci je již druhý díl této trilogie. Pro hlavního hrdinu mám opravdu velkou slabost. Již v prvním díle si mě získal svou krutostí, chytrostí, nebojácností, ale také dobrým srdcem. Po přečtení druhého dílu jsem si říkala, že by Thomasovi neuškodila ještě krutější povaha. Obvykle to nesnesu, ale tenhle akolyta si o to naprosto říká. Nicméně, ačkoli jsem byla z pokračování Levé ruky Boží unešena, nemohu říci, že by bylo stejně tak výborné. Ani nedokážu přesně popsat v čem, ale zkusím něco vypotit. Možná si Thomas zasloužil více prostoru, ale něco mi říká, že ten prostor, který autor věnoval i jiným postavám a různým dějům, budou nezbytné pro další pokračování. Co se týče jeho milované Arbell, kéž by dostala více prostoru i ona, ale opět, mám takové tušení, že ona a Thomas si společné chvíle užijí v posledním díle. Stejně jako při mnoha jiných trilogiích mi i zde přišlo, že je druhý díl jakýsi mezičlánek k famóznímu finále. Co bych ale neměla nechat jen tak ladem je fakt, kolik kvalitní „šťávy“ dodal autor tomuto dílu. Dřív než jsem dočetla do konce, musela jsem si přečíst čtyřstránkový doslov autora a byla jsem naprosto uchvácena, co všechno musel přečíst a prostudovat, aby měl pro knihu tolik nápadů. On sám se nestydí přiznat, z kolika různých zdrojů čerpal a ktreými se nechal inspirovat, budiž pochválen, jelikož většina čtenářů by se k takovým materiálům zjevně nikdy nedostala. Tak tedy, Thomas Cale, Váhavý Henry a Kleist (obzvláště na tohohle klučinu se v příštím díle těším, jelikož jeho příběh je také velmi zajímavý), to jsou nejdůležitější jména, která vedou celý děj. Iddris Pukke dostal jen velmi málo prostoru (škoda, chyběly mi jeho hlášky), vykupitel Bosco se naprosto ohromil svým chováním vůči Caleovi a musím říct, že si mě trochu získal svou láskou ke Caleovi, jelikož se zdá, že on jediný v něj maximálně věří i přes všechny nesnesitelná příkoří, která mu prováděl v prvním díle. No a nakonec je tu podvraťák Gil – něco jako rádce Bosca. Proč podvraťák? V posledních řádcích této knihy se to dozvíte. Snad nemusím říkat, jak nesmírně se těším na druhé pokračování a v momentě, kdy píši tyhlety řádky, ještě stále nevím, kolik hvězdiček dát. Když dám čtyři, mám pocit, že knihu urazím, když dám pět, urazím první díl, který byl doopravdy o malý chloupek lepší… Po deseti minutách rozjímání jsem se rozhodla, že dám hvězdiček pět. Jelikož Paul Hoffman je člověk, který přelomil moji bariéru strachu a odmítavosti číst cokoli z historické fantasy. Za tohle mu opravdu vděčím. this book was just as great as the first book. It had an awesome plot which contains a twist at the end which you will NEVER (and believe me when i say NEVER) see coming. The writing was as gripping as always and no less expected from paul Hoffman whose fast becoming one of my favourite authors. now, some people might say that this book was darker than the first and to a degree this is true but its only because this book doesn't have all that sappy romance in it (not that there's anything wrong this book was just as great as the first book. It had an awesome plot which contains a twist at the end which you will NEVER (and believe me when i say NEVER) see coming. The writing was as gripping as always and no less expected from paul Hoffman whose fast becoming one of my favourite authors. now, some people might say that this book was darker than the first and to a degree this is true but its only because this book doesn't have all that sappy romance in it (not that there's anything wrong with that. i kind of like sappy romances but I like both people in the relationship to feel the same way). In the four things, the world into which we were introduced before is developed further and you delve further into this fictional world, learning more of its histories and cultures. Which was very interesting. as some of you may have realised, I tend to base my star ratings on the awesome-ness of the main character, the plot and the way is written. So to me, as you might've guessed, this character was freaking amazing. to all those thinking of reading this book, here's a little run down of what to expect. First of all, this is not a book for the faint-hearted. If you love happy endings, perfect characters who never make mistakes and bright, cheerful atmospheres, DO NOT read this book. However if you don't mind dark, gritty books which pull you into a world of corruption and conspiracy, epic plans and battles and ingenious schemes with a little hint of romance (or a lot) and complicated relationships with friends, READ THIS NOW. So what can you expect? this book starts off right where it left off in the left hand of god. From there you follow the torment and misery of Cale as he descends steadily into the darkness as well as other threads from other character's old and new like IdrisPukke, Vague henry and Bosco, all the way up to the inevitable and mind-bloeing twist at the end of the story that just makes you want the next book ASAP. So in conclusion if you don't mind dark books, read all about the epic and tragic (wait actually ignore that, he might have a happy ending) of Cale. oh my god i feel so sorry for Cale. After all the harshness of his childhood and all the cruelty he had to endure...and the ungratefulness of most of those he had saved....I'm not really surprised Cale ended up the way he was. His fighting and tactical skills awe soooo awesome though. like seriously. its freaking awesome. Sia chiaro che odio queste finte trilogie. Non sono tre romanzi, ma un unico romanzo in tre volumi. La storia diventa sempre più complessa e le battaglie sempre più violente. Le vicende personali sempre più drammatiche e gli incontri sempre meno verosimili, ma, in un romanzo del genere, va bene così. Mi tocca leggere il terzo tomo. So how does the sequel to "The Left Hand of God" fare? I think for a lot of people it will have a similar marmite effect, it is one of those books that leaps and bounds around the imagination, pulling references from the literary world willy-nilly EG: Edmund Spencer's A view of the present state of Ireland, to show a description of starvation (which Hoffman does in gruesome fashion), the king James bible, a Boer war training manual and many more. As well as ideas from histo "The Last Four Things"
So how does the sequel to "The Left Hand of God" fare? I think for a lot of people it will have a similar marmite effect, it is one of those books that leaps and bounds around the imagination, pulling references from the literary world willy-nilly EG: Edmund Spencer's A view of the present state of Ireland, to show a description of starvation (which Hoffman does in gruesome fashion), the king James bible, a Boer war training manual and many more. As well as ideas from historical references and a geographical elasticity that just boggles the mind, Spanish Leeds being just one example a story that is laced with cynicism at so many elements of society and religion. In this book there is also a heavy dose of cynicism aimed at the ease of propaganda and its use in society to tip the balance of power to any intended use. I have read reviews that state the characters are flat and some of the prose ill formed, I personally have to disagree, I have found that the characters are growing well with the books, there is a very dark dangerous brooding character to Cale, and Vague Henry and Kleist really are growing as individuals in this book with unique characters that really shine out from the page, if they are less dynamic than Cale it feels deliberate to me because what else could they be when this attention black hole enters the room/ page. For me this is one of the most original fantasy series in many years, I have been put off fantasy in many ways since the death of David Gemmell, and this is one of the few authors able to drag me back. This is a much smaller scoped story and plot but the book is epic in its adventure and battles. We are treated to more story and more development of Cale. The story moves along at a brisk pace and I found that I had quickly read through it. I recommend this series and will be quickly moving on to the next book. Sure I read it fast, but would I have read on if this had been book 1...? No. I have to read it ok then. The thing is that nothing happened, and if something happened it was rather fast and dull. What is Cole now? 15? Srsly he should be older, I cannot take him for serious. He goes from lamenting over Arbell (how old was she anyway? euww.) to butchering people. All while I am all, just put a arrow through his neck. That kid needs a talking to. I liked him in book 1, there he was growing, here I c Sure I read it fast, but would I have read on if this had been book 1...? No. I have to read it ok then. The thing is that nothing happened, and if something happened it was rather fast and dull. What is Cole now? 15? Srsly he should be older, I cannot take him for serious. He goes from lamenting over Arbell (how old was she anyway? euww.) to butchering people. All while I am all, just put a arrow through his neck. That kid needs a talking to. I liked him in book 1, there he was growing, here I cannot forget what a kid he is. Also, is this our world or not!? If not, then why use our places names? Lame! If so, then how can they move so fast from one part to another? It is starting to annoy me, just make it fantasy and without a map I would not know. The crazy religious people, well you know what, crazy is always interesting and I hope they all die. Not as good as the first one. This book was dragging and I had to skip so many pages about war and stuff that I didn't need to read about. Only in the last few pages,the plot started to become more interesting. I hope the next book is like the first one. Hoffman non è un cattivo scrittore, ma neanche bravo e forse a volte vuole riscrivere Il Signore degli Anelli, ma altre vorrebbe scrivere una storia sua. Sta di fatto che anche con questo secondo libro siamo alle solite....prime 200 pagine: na noia che ti pugnaleresti gli occhi e le ultime 100 che non smetteresti mai di leggere. La prima parte è legata al rientro di Cale nei Redentori. Tutta questa parte ti fa letteralmente girare le balle perchè non si capisce bene dove si voglia andare a parare, con guerre di qua guerre di là, che vanno benissimo ma fino a una certa, sangue a fiumi e chi più ne ha più ne metta. Ma prelude a una parte molto più dinamica e "allegra". Secondo me Hoffaman si è imposto di scrivere una trilogia per marketing, ma lasciatemelo dire: bastava un volume solo e sferruzzare qua e la battaglie inutili, che dal punto di vista narrativo sono di una noia assoluta e il rischio è quello di riscrivere sempre la stessa cosa. Rimango ferma sulla questione del periodo temporale in cui è ambientato....vago, non chiaro, a volte sembra un futuro uscito da una immensa catastrofe, a volte sembra di essere nel medioevo, a volte nel presente...insomma non c'è una definizione, se poi Hoffman voleva crearsi un suo personale periodo storico bisogna chiederlo a lui, molto confuso per me. Ribadisco anche che la caratterizzazione dei personaggi è fatta bene, loro sono chiari e limpidi, mi piace anche il doppio gioco del carattere del protagonista e dei suoi co-protagonisti. The Last Four Things is the sequel to Left Hand of God. It continues to follow the story of Thomas Cale, now back with the Redeemers, and separated from his two `friends'. I will start with what I liked. The first thing, which I also liked about the first book, was what feelings I have when reading about Cale. I feel pity, sympathy, but mixed in with disgust. Sometimes his actions make me cringe, and his coldness make me fear he knows no remorse, his actions make him seem like a stone-cold killer. The Last Four Things is the sequel to Left Hand of God. I will start with what I liked. The first thing, which I also liked about the first book, was what feelings I have when reading about Cale. I feel pity, sympathy, but mixed in with disgust. Sometimes his actions make me cringe, and his coldness make me fear he knows no remorse, his actions make him seem like a stone-cold killer. At other times however, I empathise with his burden, think him a hero, a saviour, etc. Safe to say, very mixed emotions. But that is perfect, as that is what most people in the book feel towards Cale. Admiration mixed with fear. I very much like the way the author conveys these sentiments and drags the reader into the jumble of emotions. This is no ordinary protagonist. In my review of the first book, I commented on the narration, where the author seemingly talks to the reader. To explain subtext, or what I really liked, upon introducing a new character, in a very absorbing way, will delve into who the new character really is, and who people perceive him to be. In the first book, this form of narration would show itself sometimes, but not often enough to really represent `the' style in which the book was written. I feel the author fixes that with this second installment. His narrative style is now truly the style that is used throughout the book, and it serves the book well. There is more consistency. I find this book much better written than the first one, not only because of the narrative style, but also because it has grown somewhat more verbose. It feels less `simple' because of the wording. Verbose for the sake of being verbose is never a good thing. But often it adds to the story, and it definitely does here. Events have more depth because they are better described. Characters are introduced more elaborately making you wonder whether to store all that information, because this person might turn out to be important. Or will he? Seeds of doubt are planted with much more skill than in the first book, where some things were quite transparent. However, there are some things I don't like. I feel that more than half of the book is filled with battle tactics. It goes on and on and on and on. If this was a first book, I would shrug and say `okay, not the book for me, moving on'. But this is the second in the series. The first also had battle strategies, but when reading the first, I don't think anyone expects the second to be that much centered around strategizing. It was like the promise of the first book, content wise, was broken with the second book. Everyone that sees this through though, that manages to wrestle through all of the fighting talk, is awarded generously with again, an excellent and powerful ending which will make you crave the sequel. The twist and turns in the plot are interesting, but I dare not judge more thoroughly than that. In the first book, there was (what seemed to be) an interesting plotline, starting at the beginning, concerning an item Cale finds. This plotline was (seemingly) tied off neatly by explaining what the item was. It left me dissatisfied and it felt a bit weak. The author definitely knows how to create plotlines that make you want to read on and find out how they end. But I hope, not every created plotline is finished up as clumsily as that of the item which I talk about in this paragraph. Promise is there, definitely, execution of ending could be better. However! I dare not claim that the ending of the plotline as I perceive it, is the true ending of said plotline. Things have a way of popping back up. So maybe, I will get to eat my words later, I very much hope I will. The Last Four Things continues the story begun in The Left Hand of God with Thomas Cale - the young man heralded as the 'Incarnation of God's Wrath' - back in the hand of the Redeemers and his erstwhile and hated master Bosco. Bosco believes that God has ordained the race of mankind to be destroyed for it's imperfection and that Cale is the instrument of the Almighty's anger. Cale, heartbroken and disillusioned by the events in the first book, goes along with Bosco's direction as life with the Re The Last Four Things continues the story begun in The Left Hand of God with Thomas Cale - the young man heralded as the 'Incarnation of God's Wrath' - back in the hand of the Redeemers and his erstwhile and hated master Bosco. Bosco believes that God has ordained the race of mankind to be destroyed for it's imperfection and that Cale is the instrument of the Almighty's anger. Cale, heartbroken and disillusioned by the events in the first book, goes along with Bosco's direction as life with the Redeemers is one he understands, if not cares for. He is sent to turn the tide in the war against the Antagonists and lead Redeemer forces to victory, so that Bosco will be able to reap the rewards of his protege's successes and gain futher power. This Cale accomplishes in a typically ruthless manner. We also follow Cale's former cronies Vague Henri and Kleist. Kleist, having abandoned his fellow Redeemers to get as far away from his former life as possible, inadvertantly saves the life of a young girl who he subsequently falls for. She brings him back to her tribe - a group of cheerfully craven bandits. Vauge Henri doggedly follows Cale in the hope that, with IdrisPukke's help, he can be made to escape the Redeemers again. As with the first book, I am little confused with the tone. The style of narration and the prose used is both florid and knowingly sardonic. The story veers from pitch black humour to poignancy to uber-violence to ridiculous and back at breakneck speed. As with the previous installment I enjoyed the blatant potshots at the absurdity of religion which seems one of the major themes of the book. Even more than in the first book Hoffman uses real place names to populate this world like Switzerland, The Rhine, Stuttgart and most notably for me - my hometown Leeds which is cheerfully insulted, even in a fictional world. Maybe it shouldn't be a big point but it jars me from fully enjoying the story. I get that maybe Hoffman is trying for the 'dark mirror of the real world' but Terry Pratchett manages a similar line without re-using existing names. I picked up the first book based on a good review by a critic. I had a lot of high expectations from the first book (The left Hand of God) which unfortunately it was not able to live upto. But after starting the story I just had to see it through. So this is how I continued on the adventures of one Mr. Thomas Cale and believe me I was just blown away. The book was unputdownable (not only because of the long chapters). 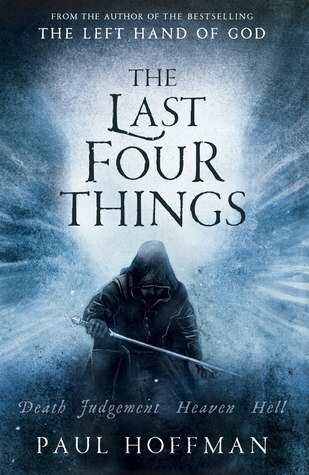 The Last four things is a good fast paced continuation to a rather slow start. The Last four things is a good fast paced continuation to a rather slow start. The writer gets down to business in a no nonsense manner and makes you experience the fiction world of the Redeemers in a manner few may manage. The character development is superb and you could feel the individuality of the characters coming out as if you are reading a life history of a different era/world. The writeup is filled with clever anecdotes and hidden/blunt references most of which are credited in the acknowledgement section. I personally think this is a personal best for the writer. Paul Hoffman is a clever writer who writes in a truly different manner. If you have a below average hold on the language/word play you might get confused at times("... he walked as carelessly as he would in the middle of a training ground..."). But once you truly get attuned to the words you start getting the juice flowing. It becomes a joy to read him and I will certainly recommend this book. To conclude I would like to state that the book is a major triumph and I can't wait for the conclusion of the trilogy. Many a time we see a story building up to a crescendo and then falling flat at the end (something I will not like at all in this case). The expectation shall be numerous and to make a satisfying conclusion shall be a challenge for the writer. I hope he delivers a knockout punch. Now, to say that Cale is an evil mastermind is completely overstating it--he's just had a combination of (mostly) bad luck and overconfident ego. Which doesn't change in The Last Four Things... He's still a cocky teenager, only now he has the Redeemers behind him. He's still furious at Arbell's betrayal--though what else was she to do? And he's still a teenager, thumbing his nose at the Redeemers when he doesn't think they'll get it, and even sometimes when they do. So then are we surprised that calamity and glory meet Cale in equal increments in this sequel? Why, of course not. There's a lot of tongue-in-cheek humor in The Last Four Things, as well as a lot of needless bloodshed. Of course, all bloodshed is needless (in my opinion), but even more so when it's the result of mostly stupid actions. As my little man will tell you, I do not like stupid. Excessive stupidity even less so. And while I enjoyed the overall plot I did wonder where all the smart people went. Unfortunately some well-meaning friends gave me the third book for xmas last year. Well me being me, rather than thanking my friends and returning the book, I loaned The Last Four Things from the library. What struck me first is an apparent change in tone. Maybe I just didn't pick up on it in the last book, but the voice narrating this piece espoused far more sarcastic humor than before. While the change in tone was welcome in a way as it morphed the melodrama of the story into satire, the series is still difficult. The main problem with Last Four Things it the protag Thom Cale, currently back with his Redeemer 'buddies' spends the majority of the book non-plussed about his situation, creating a similar effect in the reader. Only by the last quarter does stuff start happening, and its reasonably exciting stuff, but like many episodes in a series, one finds the author may just be filling time before some decent events because these days your epic fantasy has to be at least seven books to be respectable. This was no where near as the first one in the series. It was... passable. After the first one I felt that there was great character development and a great plot line getting ready to unfold. However, the reality was something else. The plot was... boring. It didn't hold much attention for me and seemed to jump around the place. The characters became annoying and dull, and as the time passed so quickly I just couldn't give a damn about them or what they were up to. In fact the first three quarte This was no where near as the first one in the series. It was... passable. In fact the first three quarters of the book I found it hard to resist the impulse to skim ahead - and the parts regarding Kleist I did skip after he moved in with that tribe. It felt very much like an interim book, as if it was filling the void between two great parts of an epic tale. It is this feeling that there is a better part to come, mixed with the knowledge that this story can be fun (as evidenced in The Left Hand of God) that I plan to read the next installment when it is brought out. In fairness this book is readable and not majorly off-putting, but to be honest I felt like I would have been better off reading chapter by chapter bullet point synopsis - so much quicker, and all with the same detail. For those who have read the first book then this is worth a read, but for new readers I suggest reading the first one (duh!) and if you love that then try this. Like the first book in the trilogy, my rating for this one is more because it's so memorable and well-executed than because I liked it. There is a lot a person *could* like about this book, but you also have to be able to tolerate the very cynical view of humanity it takes as well as horrifyingly-skewed version of Christianity it portrays. It's all really interesting stuff, and I can see some readers loving this and others hating it. I was merely flummoxed by it, but I also haven't been able to s Like the first book in the trilogy, my rating for this one is more because it's so memorable and well-executed than because I liked it. There is a lot a person *could* like about this book, but you also have to be able to tolerate the very cynical view of humanity it takes as well as horrifyingly-skewed version of Christianity it portrays. It's all really interesting stuff, and I can see some readers loving this and others hating it. I was merely flummoxed by it, but I also haven't been able to stop thinking about it. The writing is strong and clean, although in this book, I found the author lapsed more into "telling" and did less "showing" than in the first book. The main characters are shockingly hard-edged and at the same time incredibly naive and thus they have zero defences when it comes to the perils of love. That was kind of endearing. Mě se to líbilo mnohem víc než první kniha. Možná je to tím že jak jsou prázdniny a v knihovně nic není a já se nemůžu dokopat ke Kindlu, probírám se samýma plevama tak mi tohle přišlo dost dobré. Já toho hajzlíka Calea prostě žeru a jsem fakt zvědavá jak to s ním dopadne, doufám že se nenechá zabít! Jen by mě zajímalo, taková věcička - jestli si to pan Hoffman dobře spočítal...? V knize se tvrdí, že ta Kleistova kočena je v devátém měsíci, ovšem Arbell je v měsíci osmém a tvrdí že dítě je Caleo Mě se to líbilo mnohem víc než první kniha. Možná je to tím že jak jsou prázdniny a v knihovně nic není a já se nemůžu dokopat ke Kindlu, probírám se samýma plevama tak mi tohle přišlo dost dobré. Já toho hajzlíka Calea prostě žeru a jsem fakt zvědavá jak to s ním dopadne, doufám že se nenechá zabít! I was pretty disappointed, really. Two years ago, I found `The Left Hand of God' to be a really wonderful book. I loved the protagonist Cale, and the setting in The Sanctuary. I was looking forward to this sequel that I even temporarily quit another book I'm curently reading to start with it as soon as I got my hands on it. This time, however, I was never really dragged into the story, nor the world in which it takes place. Also the dark and bitter atmosphere I loved so much in the first book se I was pretty disappointed, really. Two years ago, I found `The Left Hand of God' to be a really wonderful book. I loved the protagonist Cale, and the setting in The Sanctuary. I was looking forward to this sequel that I even temporarily quit another book I'm curently reading to start with it as soon as I got my hands on it. This time, however, I was never really dragged into the story, nor the world in which it takes place. Also the dark and bitter atmosphere I loved so much in the first book seemed absent to me in `The Last Four Things'. Последно време на Запад има една тенденция - пусне ли се качествена книга, почват да се пишат едни дълги продължения, сякаш се готвят все ново колело да издават . Тази книга е поредната в този списък. Първата беше сравнително нова и интересна, но във втората част действието се разстла така, че не е ясно как ще се събере. Авторът е доста добре запознат с военната история и продължава да се бъзика с големите битки в Средновековието, макар че обърква тотално епохите - праща спартанци срещу оръдия. Пр Последно време на Запад има една тенденция - пусне ли се качествена книга, почват да се пишат едни дълги продължения, сякаш се готвят все ново колело да издават . Тази книга е поредната в този списък. Първата беше сравнително нова и интересна, но във втората част действието се разстла така, че не е ясно как ще се събере. Признавам има много добър стил, книгата има доста афоризми, а превода на Любо Николов е брилянтен. Possibly the only novelist of his generation to be born by the light of a paraffin lamp, Paul Hoffman spent much of his childhood on airfields all around the world watching his father – a pioneer of sports parachuting and European Champion – jumping out of aeroplanes. After a long battle with the English educational system which involved avoiding school whenever possible he was offered a place to read English at New College, Oxford when no other university would interview him. After graduating he worked in over twenty different jobs, including boardman in a betting shop, messenger boy to a City merchant bank and teacher. He was also senior film censor at the British Board of Film Classification.